FREE Course: Knowing when to Code in Salesforce! If you’re ever confused about which tool is right for the job in Salesforce, this course is for you! Apex code, Process Builder, Workflow Rules, and Flow… each has their pros and cons. These tools are optimized for specific situations – join Don Robins and I to learn when’s the best time to use them! 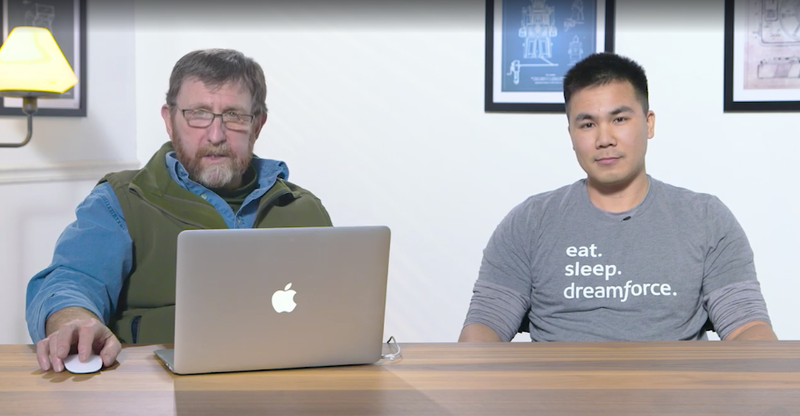 Watch the free course: Knowing when to Code in Salesforce! Dive into the the pros and cons of various “clicks vs code” tools such as Apex, Workflow Rules, and Process Builder as we work together to solve a common business scenario. By the end of this course, you’ll have learned a step-by-step approach to decide whether or not you should use code in your next Salesforce project. This course will be free only until June 11th 2018, so check it out while you can! It’s the perfect starting point for the Apex Academy too! Go, Don and David! Thank you for sharing this valuable resource. Will be on it this evening! Thank you, David. I am enjoying the class very much, but I have couple questions want to ask. 1. Should we shy away from using the workflow rule, instead we should start using Process Builder? The reasons are that Salesforce is no longer adding more features to workflow rule, but Process Builder is becoming more powerful and perfected. 2. I know the question is not should we but how soon should we move to lightning experience from classic? If so, I will propose remaking the course using lightning. Thank you very much for making and sharing this free course. Don, the older the wiser! David, thank God for workflow has no respect ^_^! Workflow rule is very efficient and has no bugs – In an environment where speed counts I prefer it to PB! It’s time to move to Lightning =) All the concepts are the same in Lightning (nothing changes in the back-end), just the look is different! Sorry, David. Can I clarify when you said “PB” is this means process builder? If yes, how do we measure process builder (a process) is faster workflow rule (a workflow)? Also, can I add lightning is not only the look but many new functionalities have been created only available in lightning LEX or at least only work well in LEX? Am I correct on this? Thank you very much again. Thanks David for your great vision. Suggest me more about your course. And how can I avail it.